It is not sensible for Belfast to have two airports that are just 14 miles apart, the Northern Ireland Affairs Committee has been told. Jim McAuslan, general secretary of the British Airline Pilots Association, told MPs there needs to be debate about airport provision in Northern Ireland. The committee was examining air links to and from Northern Ireland. Mr McAuslan said his members had been asked whether NI should only have one airport and they had agreed. He said the decision on whether it should be at George Best Belfast City Airport or Belfast International was a matter for politicians. Mr McAuslan told MPs “it comes down to politicians and how brave politicians are going to be”. He said it was important there was a debate about airport provision and concentrating resources at one site would be “a brave thing to do”. Mr McAuslan represents 70 pilots in Northern Ireland. He said that his members told him that there was over capacity in Northern Ireland and there was the “wrong sort of capacity”. He added that any debate over airport provision would have to examine areas such as safety and public demand. Antoinette McKeown, the chief executive of the NI Consumer Council told MPs that both George Best Belfast City Airport and Belfast International were “private concerns that don’t take money from the public purse”. She said both airports offered “consumer choice and the sustainability seems to be there”. 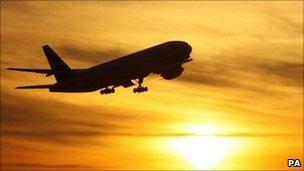 MPs have already taken evidence from representatives of both airports, as well as from City of Derry Airport. They are to take more evidence next week.